Puritan 25-3306-U TT FDNA DNA-Free Ultra Flocked Swab w/Transport Tube is a sterile applicator that has a standard ultraflock tip with a polystyrene handle. The tip of this applicator is a soft, smooth medical grade material called PurFlock that is highly absorbent and is perfect when HydraFlock high absorbency levels aren't necessary. This material is bonded to a polystyrene handle that has a molded breakpoint and is perfect for many environments for task's like forensic evidence and speciment collection, rapid diagnostic testing, and DNA testing. The 25-3306-U TT FDNA HydraFlocked tip applicator is CE marked for medical use and meets FDA GMP's, ISO 9001:2008,and ISO 134585:2003 standards (certificate of sterility and/or conformance available with each shipment upon request). This applictor is tested by an independent lab to the most stringent standards (less than 25 pg of human DNA) and certified to be DNA-free and RNase-free. The flock tip material refers to the process of applying short fibers to an adhesive-coated surface. This process turns the swab into a velvet-like brush by precisely placing the fibers around the tip of the handle. This flock material holds more specimen and then elutes it faster and more completely than regular fibers, which is important when dealing with sampling of small and elusive specimens. Puritan uses an exclusive proprietary multi-length fibers to create the HydraFlock and PurFlock lines. 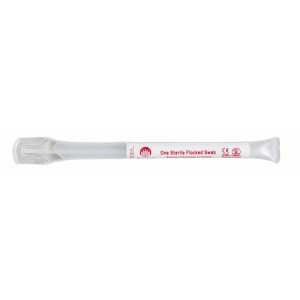 Overall Length / Tip 6.02"
Packaging 10/50/1 (10 boxes of 50 individually wrapped swabs = 500 per case).